In this article, I thought we’d have a brief look at exactly what it is that the katas record. Katas are not simply a record of techniques; rather each and every kata is designed to record the key principles and strategies of a complete style of fighting! Obviously it would not be possible to record every single technique, as the kata would become impracticably long. It would make much more sense to record techniques that expressed the key principles of the fighting system. A good understanding of solid combat principles is infinitely preferable to simply memorising many techniques. The “if they do that, I will use this technique” school of fighting is always doomed to failure because it places the opponent in charge! It is not techniques that win fights but an understanding of combat principles and a strict adherence to them. All techniques are simply manifestations of these principles. By recording the principles of combat upon which a system of fighting rests, it is possible to record a vast amount of information in a relatively short kata. Naihanchi (Tekki) is probably the shortest kata, and yet Master Itsou required Gichin Funakoshi to practice Naihanchi, and only Naihanchi, for the first nine years of his training! This would have made little sense if Naihanchi were not a complete system of fighting in its own right. Hironori Otsuka, in his book ‘Wado-Ryu Karate’ said that Naihanchi would take more than a lifetime to master and, “there is something deep about it.” It is not that the techniques themselves would take a lifetime to understand, rather it is the principles and concepts demonstrated by the kata that makes it so deep. The proposition that Naihanchi was intended to be a stand alone fighting system is supported in the writings and teachings of Choki Motobu (1871-1944) who was one of Okinawa’s most feared fighters. In 1926, Motobu wrote, “The Naihanchi, Passai, Chinto and Rohai styles are not left in China today and only remain in Okinawa as active martial arts.” In the preceding quote you will notice that Motobu refers to the katas listed as “styles” and “martial arts.” This statement is further evidence that each and every kata is a complete system of fighting in its own right. Knowing this, it is possible to understand why the masters of old would know only one or two katas. It is this deep understanding of a kata’s principles and concepts that made the masters of old so formidable. Compare this with the situation today, where even relatively low grades know many katas but generally don’t have the first idea of how to apply them. The concept of principles over techniques can be a difficult one to grasp. An analogy that may help is to think of a fighting system as an oak tree. An oak tree is vast, both in its size and years lived, but everything about that tree, and everything required to reproduce it, is found in a single acorn. A fighting system produces a kata in the same way that an oak tree produces acorns. Both the acorn and the kata are not as vast as the thing that created them, but they record them perfectly. For an acorn to become an oak tree it must be correctly planted and nurtured. For a kata to become a fighting system it must be correctly studied and practised. It is here that we find one of modern karate’s biggest failings, in that the katas are rarely studied sufficiently. To return to my analogy, we have the seeds but we don’t plant them! 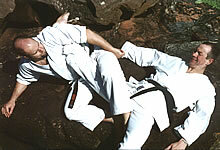 It is vitally important to understand the principles upon which the techniques demonstrated by the katas rest. If you do not, you will be unable to utilise those techniques in anything but the most perfect of circumstances. What if the opponent is taller, closer, stronger etc.? If you understand the principles upon which the techniques are based, you will be able to adapt those techniques, in line with the principles upon which they rest, for use in many other situations. The great Choki Motobu put it very eloquently when he said, “One must learn how to apply the principles of the kata and how to bend with the winds of adversity.” This is a vitally important concept to grasp. No two fights will ever be the same. To try to prepare for every conceivable combat situation is futile. Although no two fights will ever be the same, the principles that will lead to victory never vary. Recorded within the katas you will find the fighting principles of its creator. The techniques are important, but not as important as the principles of combat behind the techniques. It is an understanding of these principles that will allow you freely and effectively express the katas in combat. The Bunkai-Jutsu book discusses these concepts in great depth and I’d ask you to consult it if you’d like to know more.